Brittani Dahlman recently received a bachelor’s degree in social work from Aurora University. She also earned an eclectic education in humanity. That’s because Ms. Dahlman, 22, served as an intern during this past school year for Public Action to Deliver Shelter (PADS) of Kendall County. Ms. Dahlman and fellow intern Andrea Spanier teamed up to develop PADS’ new Guest Assistance Program. The GAP enabled the nonprofit, homeless assistance organization to move beyond its basic mission of providing food and shelter to also assisting with employment, permanent housing, and social services. For the past seven years, Kendall County PADS has been providing nourishing meals, overnight stays, and kind hospitality to the local homeless from mid-October through mid-April at seven area churches. This was the first shelter season during which PADS partnered with Aurora University’s prestigious School of Social Work. The two interns augmented the assistance provided by a social worker from the Kendall County Health Department, who has been helping PADS guests for several years, going to the Thursday evening shelter site and connecting them to the department’s social services. Ms. Dahlman focused primarily on the employment needs of her clients, helping them write résumés and cover letters. She is particularly proud of one guest whom she helped land a job at the Caterpillar plant in Montgomery, where he was able to save enough money to secure stable housing. Ms. Spanier, 40, had a successful career in marketing and advertising until she developed health problems that stemmed from giving birth to her daughter, now eight years’ old. “When I was sick, I relied a lot on my mom, my step-mom, and my husband,” she recalled. Her recovery experience inspired her to go back to college and major in social work at Aurora University, where she plans to earn her master’s degree next year. Her PADS internship entailed volunteering during the school year on Tuesday nights at Harvest New Beginnings church in Oswego and on Saturday evenings at St. Luke’s Lutheran Church in Montgomery. She assisted PADS guests mostly with medical issues such as eye, dental, and mental healthcare. And she successfully steered a female guest with an alcohol problem into a 12-step program. 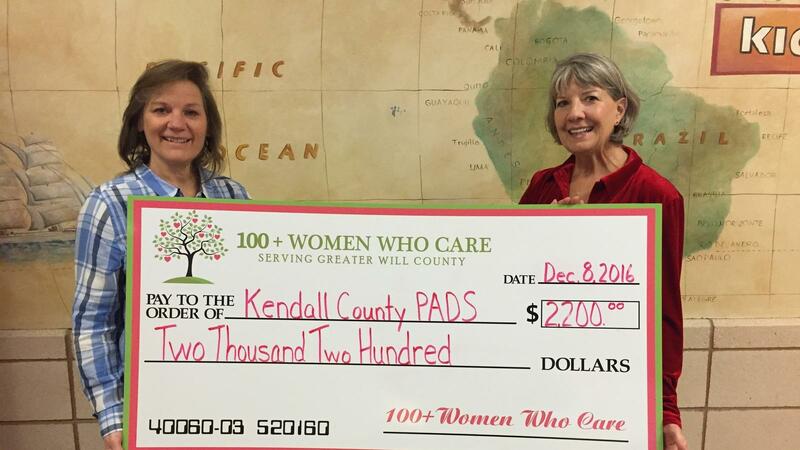 Kendall County PADS is a not-for-profit 501(c)(3) organization funded by donations received through grants, gifts, private donors, organizations, and businesses. Those who wish to donate or volunteer may call (630) 553-5073 or visit the website kendallcountypads.org. Ms. Dahlman volunteered on Monday nights at Yorkville Congregational United Church of Christ and on Wednesday evenings at the United Methodist Church of Plano.